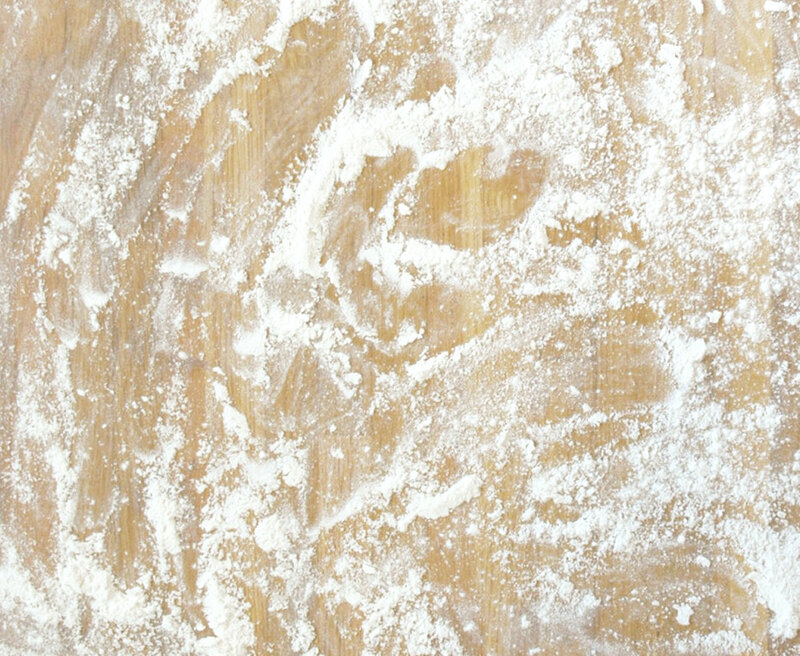 As you know, Art of the Pie’s Kate McDermott has been baking up a storm in my kitchen for the past couple of days. In June, when I first lured her to D.C. from Washington state to teach pie workshops, apricots piled up at my house for those sessions. This time, when she came back for fall workshops, the change in seasons left us awash in pears and cranberries. I confess that I had never had a pear pie–pear tart, yes, but never a pear pie. And I had never had a cranberry pie. But both were so good they made me wanna shout. Because winter holidays are approaching, it must be mentioned that the cranberry pie is a dazzlingly pretty pie, all golden and blazing red. I should have posted a picture of a big fat slice, bursting with tart magenta out of that impossibly flaky, flavorful crust. I really should have. And I would have, if only it hadn’t disappeared so quickly. (Okay, in full disclosure, I was most of the reason that it disappeared so quickly.) I will just have to bake another one and cut big fat slices out of it, photograph them lovingly, and post them here. But until then, you will have to take my word for it that this pie is a pie to be reckoned with. It’s bold and bright and not very sweet. You already know I’m a sucker for the less-sweet fruit pies: I love tart cherry, lemon meringue, apricot. 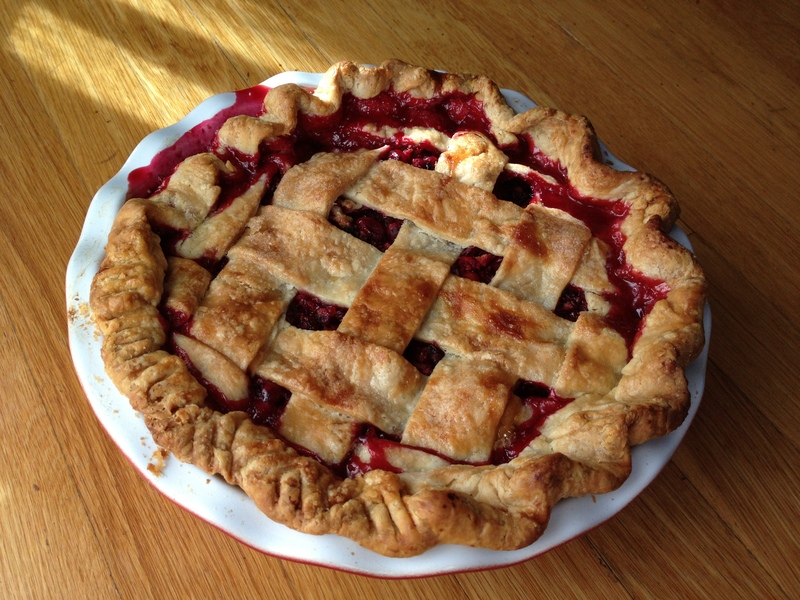 So I was overjoyed to welcome this newcomer, cranberry, to my First Family of Pies. Kate and I had fun photographing it the morning before she served slices to her workshop participants. 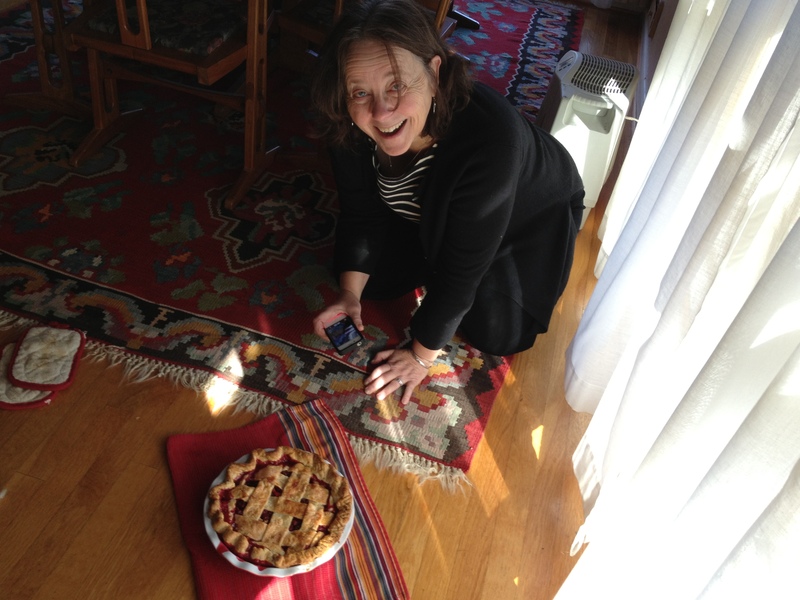 One of her Twitter followers said it looked like she was praying to the pie; Kate posted that I was engaging in an early morning pie Asana when I crouched to snap a picture of it. 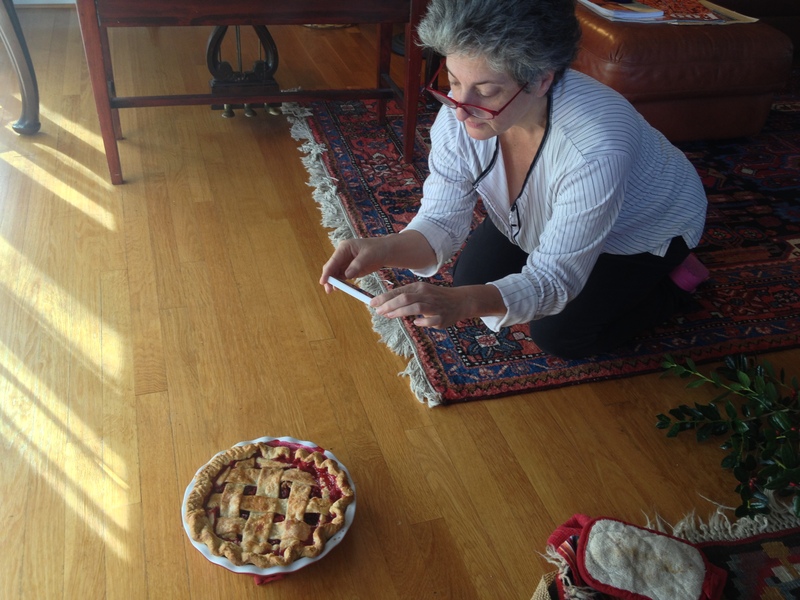 CurvyMama trying to get an angle on that yummy cranberry pie. 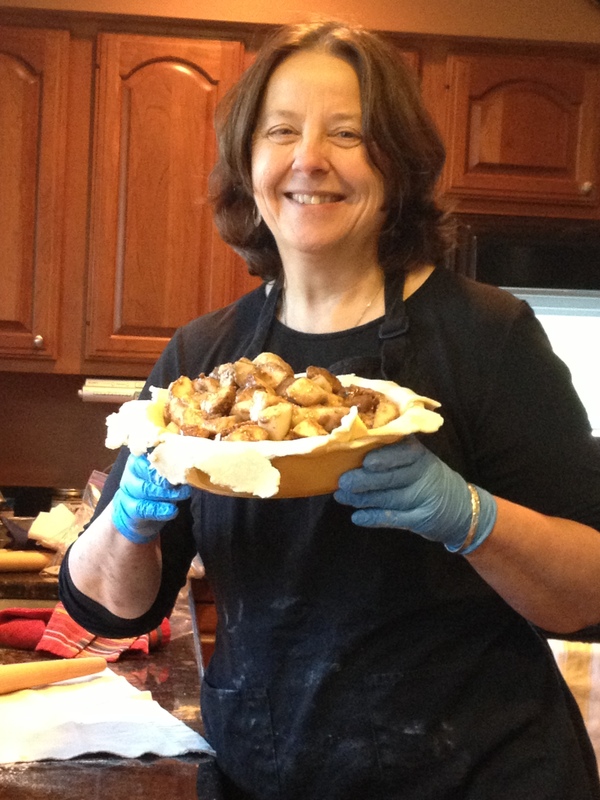 The recipes for Kate’s cranberry pie and pear pie are on her blog. You’ll see that the pear pie is posted with a gluten-free pie crust, and Kate’s is a standout. But if you want a traditional (well, waaaayyyy better than traditional) crust, you can use her butter-and-lard recipe–which is now my standard crust–or an all-butter crust, substituting 13 or 14 Tbsp. of good butter in place of the 8-Tbsp.-butter-and-8-Tbsp.-of-leaf-lard combo in Kate’s formula. With all my raving about the cranberry pie, I don’t want to overlook the lovely pear pie. It was luscious, full of pear flavor, and the seasonings smartly don’t overwhelm the more delicate flavor of the fruit. Give it a try! You won’t be sorry! Kate with her pear pie, ready to top with a second crust and bake. Wish you had been here to taste it, Evie!